Here we take a look at the stages of kitten development and growth in the thirteen weeks before a kitten leaves for its 'forever' home. Siamese kittens are pure white when they're born. Their eyes aren't yet open, their ears are folded down, and they can't hear or see anything. Newborn kittens can't regulate their body temperature, so during their first week they stay close to their mother, sleeping, feeding and relying on her for warmth. 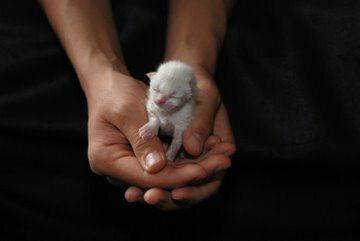 A new-born kitten weighs between three and five ounces (90-140 gm), and should gain weight at around half an ounce a day. Although development of their point colors doesn't become visible or obvious for quite a few weeks yet, by the end of week one you might be able to see just a tiny little bit of color around the edges of their ears. When do a kitten's eyes open? Siamese kittens double their weight in week two. Most of the time they continue to sleep a lot, but their legs are a little stronger now and they may begin to crawl. Development continues in the third week, when a kitten becomes more active and aware of what's going on and starts moving around in the 'nest'. Ears start to unfold and stand upright, and their teeth start appearing. As an aside, a Siamese kitten's ears will look too big for its head, and its head will probably look too big for its body, too. It takes time to grow into a pair of Siamese ears! You may be able to see a little color on the tips of the nose, paws and tail now, but it won't be possible to tell the exact point color for another few weeks. The first colors to come in are those of seal and blue point Siamese kittens, followed by chocolate, then lilac. The mother cat will now start to teach her kittens the serious matter of toileting. She licks each kitten's bottom and genital area to stimulate evacuation, and eats any resulting waste products. She continues to do this until the kittens begin to wean, and feces become more plentiful and solid. Mama rapidly teaches them to use a litter tray for themselves at this point! The kittens become more playful, exploring their surroundings and trying to climb out of their box. Development of their sharp little teeth continues, and their mother will begin to leave them alone for longer, even though they'll still be feeding from her. Their hearing will be very acute now and their eyesight will be getting stronger. Some of the more forward kittens will start to wean and begin to eat a little solid food. Siamese kittens tend to develop a little more slowly than other cats though, so may take a little longer to start on solids. The kittens will look more like their adult versions at this point, with seal and blue points being identifiable. Chocolate and lilac point Siamese kittens are a little slower to show their true colors. During this time the kittens gradually shift from being totally dependent on their mother for food to eating more and more solids until, by about eight weeks, they should be totally weaned. By now, they will probably weigh 2-3 lbs. At five weeks' old, their sight is fully developed, and by eight weeks, their point colors should be quite distinct. They'll have loads of energy, and you should start to see the development of individual personalities. The more (gentle!) handling and contact with humans a kitten receives during this period, the better. This is a time for socialization and learning what the human world is all about. Kittens of this age love to explore, and they'll be getting used to all the strange household noises like TVs, vacuum cleaners, hairdryers and sound systems. This is also when kittens get their first set of vaccinations against feline distemper (also known as enteritis or panleukopenia) and cat 'flu (actually two viruses, rhinotracheitis and calicivirus). These are normally given at around six weeks. At twelve weeks a kitten should receive its second set of vaccinations for feline enteritis and cat 'flu. Reputable breeders won't sell Siamese kittens until they have had this second round of vaccines. Most will then wait a week or so to check that there are no complications before selling. At thirteen weeks old, a Siamese kitten is ready to leave for its new home; weaned, vaccinated, litter box trained and with its own character traits well-established. Growth and development of body, abilities and personality will of course carry on for some time yet. A kitten's development continues until it reaches two years old, at which time it is considered to be a full adult.